Duck breasts are one of my favorite ingredients and probably my single favorite meat. They offer all the depth of flavor of beef, a very slight hint of gaminess and then there is the skin, the real prize. Duck and orange have a famous and natural affinity, and when I think of orange my mind goes to Spain. That, in turn sends me to chorizo – the Spanish hard stuff, not the greasy (if wonderful) Mexican product of the same name. And somehow when I think about pork products, beans come to mind. Never more so than when I saw fresh cranberry beans at Specialty Produce. 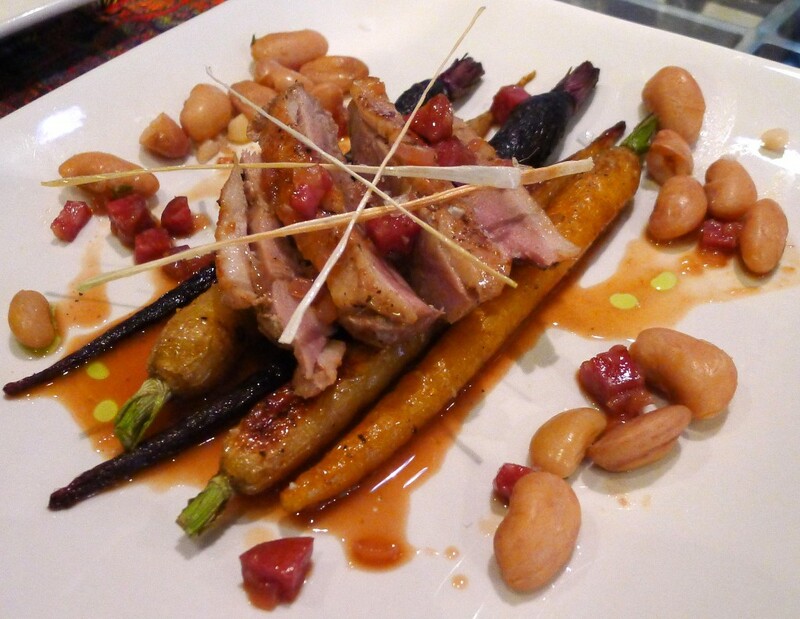 And that explains this whole dish…except for the carrots. I have no excuse for why I chose to do the carrots than the simple fact that they were in the bin next to the cranberry beans and looked gorgeous. Somehow it seemed like a natural. More importantly, it worked out well on the plate. Cook the Cranberry Beans. Shell the cranberry beans. Place them in a sauce pan with water covering the beans by an inch and add the salt and herbs. Bring the water to a boil, reduce to a simmer and cook until the beans are cooked through, about one hour. Make the Blood Orange Chorizo Sauce. Dice the chorizo and place the mea, along with the shallots and olive oil in a sauce pan over high heat. When the shallots and chorizo begin to sizzle add the liquids and bring to a boil. 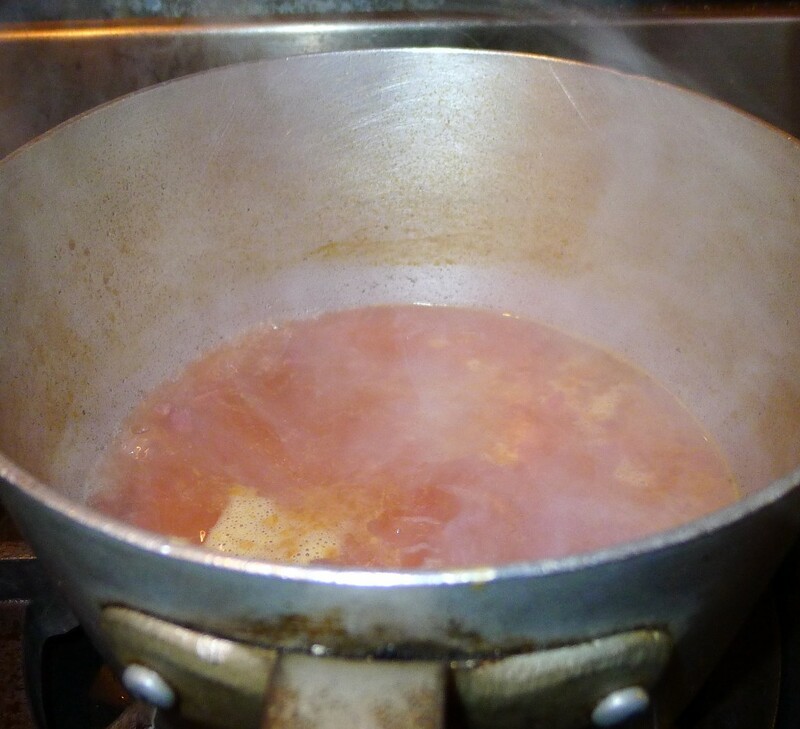 Reduce the heat to low and simmer slowly until reduced to about ½ cup, approximately half an hour. Prep the Duck Breast. Preheat the oven to 400° Fahrenheit. Score the skin of the duck breast, cutting through the skin and fat but not the flesh. Season the breasts with kosher salt and freshly ground black pepper. Roast the Carrots. Drizzle the extra virgin olive oil over the carrots in a half hotel pan and season with salt and pepper. Shake the pan to coat all the carrots with the oil. Roast the carrots in the oven for ten minutes before proceeding to the next step. Continue cooking the carrots after lowering the heat for the duck breasts. “Fry” the Leeks for the Garnish. Remove the outermost layer of the leek and slice it, lengthwise into long strips. Stretch some plastic wrap over a large plate and spray it with canola oil. Arrange leek strips on the plate. Set your microwave oven to 800 watts (the precise strength setting will depend on the total maximum wattage of your microwave oven; for me it was 6) and fry the leek strips for about 3-5 minutes, until the strips are just crunchy and beginning to brown. Pan Sear the Duck Breasts. Meanwhile, add the grapeseed oil to a small frying pan over medium heat. Place the duck breasts skin side down and fry gently, rendering the fat until the skin is crisp and golden, about five minutes. Turn over the duck breasts and sear them for 2 minutes. Roast the Duck Breasts. Reduce the heat in the oven to 375° Fahrenheit Roast the duck breasts in the oven at until just cooked and pink in the middle, about three minutes. Remove the pan from the oven and rest the breasts on a cutting board for 2-3 minutes. Plate the Dish. Remove the carrots from the oven. Slice the duck breasts lengthwise. Arrange the carrots at the center of a plate. 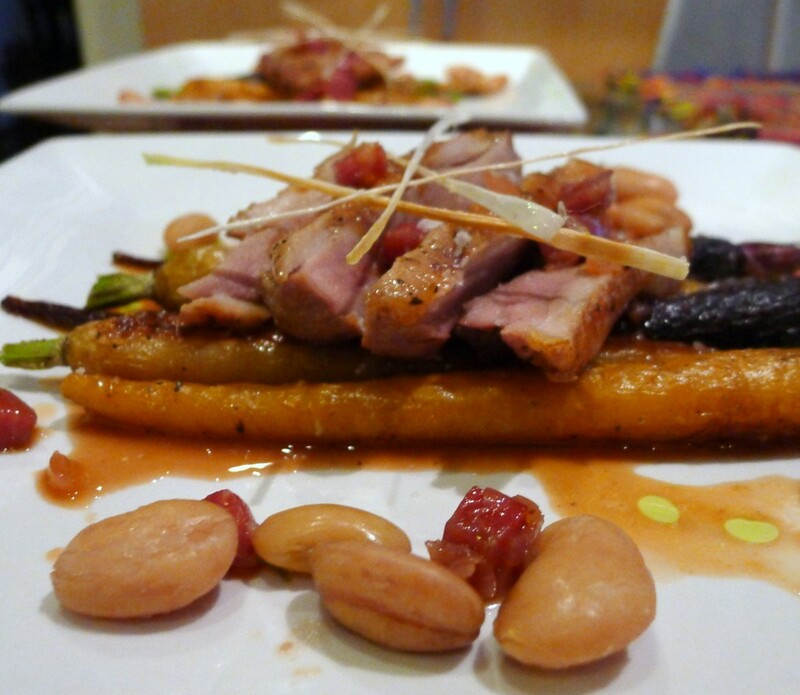 Arrange the duck breast on top of the carrots. Distribute the beans around the carrots. Pour the sauce over the duck breasts. Garnish with the fried leeks and the herb oil (if using).